The all-new 2011 Chevy Cruze LTZ is easy on the eyes, fun and easy to drive, easy on the pocketbook and easy at the filling stations. 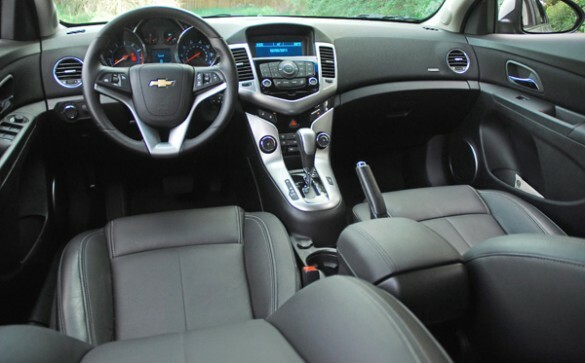 What’s more, the all-new Chevy Cruze LTZ is built and constructed like a compact costing many thousands of dollars more, has an interior that rivals the best on the market with a long list of standard features, no matter the price. The all-new 2011 Chevy Cruze has it all to jump to the head of the line with consumers looking for a compact sedan to accommodate their growing families and to keep expenses as low as possible. 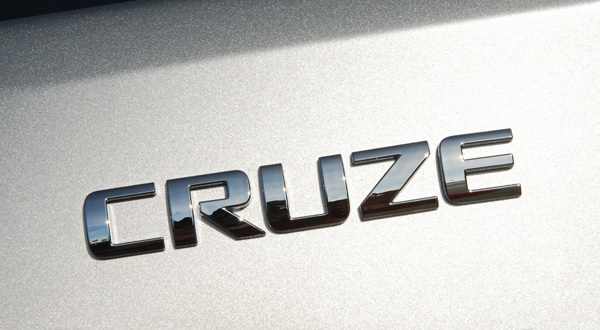 The all-new Cruze brings midsize car presence to the compact car segment like no other vehicle. The Chevy Cruze design is distinguished with a bold face-including a two-tier grille incorporating chrome surrounds and the iconic Bowtie logo-that is Chevy’s new look. An arching roofline connects a steeply raked windshield and fast-sloping rear pillars to give the car a sporty, coupe-like proportion. The sporty aesthetic is also seen in prominent headlamp housings that wrap around the corners and sweep upward in the fenders and sculpted hood, as well as a short rear deck with lip spoiler typically found on sport coupes. The wheels are at the corners, too, with minimal front and rear overhangs. Aerodynamic styled sideview mirrors and lower side extensions combine with all the elements to work cohesively giving Cruze an aggressive look that is complemented by a wide, confident-looking stance. 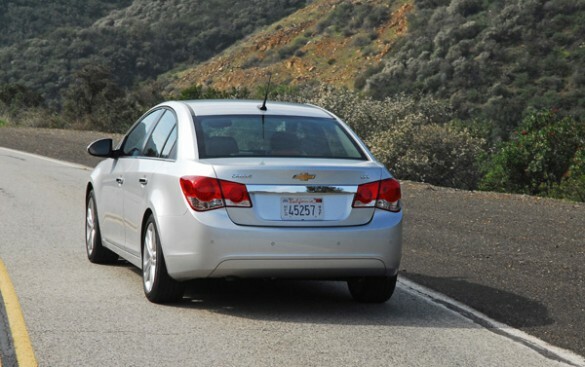 Indeed, the Cruze is wider and longer than most of its competitors. Taut, tightly drawn bodywork conveys solidity, while the use of exterior trim enhances the car’s high-quality feel. The curved, smooth lines convey a feeling of ‘built from a solid piece of metal’. The overall appearance is one of purposeful precision. 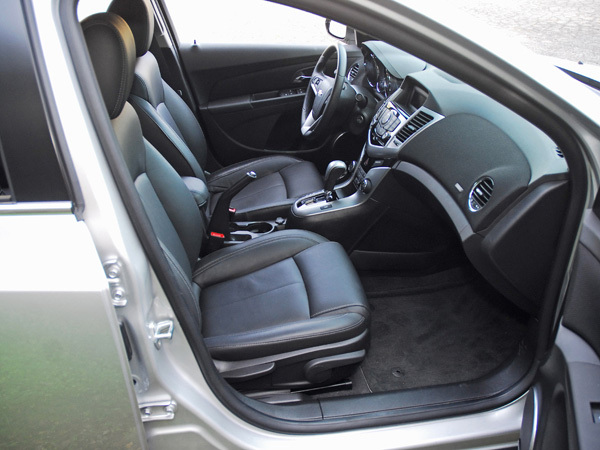 Precision is also seen in the Cruze’s build quality. The Lordstown assembly plant’s body whop was retooled with the latest in body-framing and welding equipment to optimize the manufacture of a very solid body structure. That strong structure fosters minimal production variance and repeatable gas tolerances of 3mm or less between most exterior body panels. Cruze’s bold design cues and attention to detail continue in the interior, where Chevrolet’s hallmark twin-cockpit motif is matched with high-quality materials and exceptional assembly tolerances. Grained, soft-touch components and low-gloss trim panels exude a quality that is uncommon in the segment. I was really impressed with the quality all around the interior. 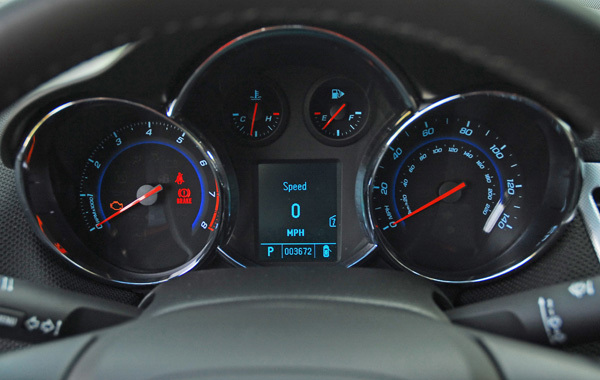 The instrument panel is an excellent example of how Cruze eschews expectations of compact cars. It features richly detailed instruments that are backlit with LED technology. The LED lights provide a crisp, ice-blue illumination of the analog gauges, as well as lighting for other interior controls. A segment-rare standard driver information center delivers a wealth of data to you. Blending harmoniously wit the instrument cluster is an integrated center stack that houses the infotainment display, climate controls and radio controls. Flush-mounted components with the center stack have a gap tolerance of less than 1mm, while the instrument cluster-to-door panel gaps are less than 5mm. Those tolerances are among the best in the class and contribute significantly to the Cruze’s overall feeling of refinement and precision. Cruze’s headliner and pill trim exude more craftsmanship too. The headliner cover is made of a knit material that also serves as one of five layers of an acoustically designed headliner that helps to make the passenger compartment quieter. The interior pillar and other moldings are color-and grain-matched to the headliner, while seat inserts are color-matched to the color of the instrument cluster accent trim, giving the cabin the detailed appearance of larger, upscale sedans. It is very impressive that GM has finally gotten the light to turn on about the importance of the interior to consumers in helping make their choice of what vehicle to purchase. 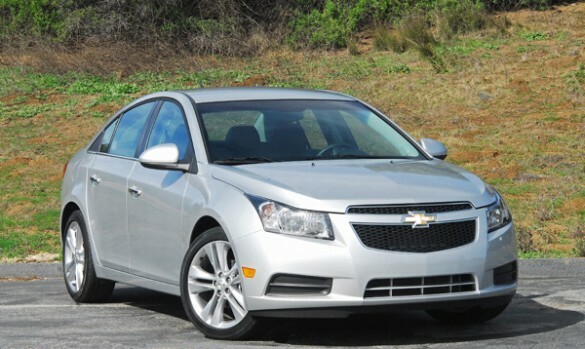 The Cruze LTZ comes standard with the all aluminum alloy, exhaust-driven turbocharged, 1.4 liter, DOHC, inline 4-cylinder engine with double-continuously variable cam phaser intake and exhaust engine that performs like a larger engine when needed, but retains the efficiency of a small displacement 4-cylinder in most driving conditions. It generates 138hp at 6,300rpm and 90% of its peak 148lb.ft. of torque at just 1,850rpm. This engine revs very easily up to its redline and is very quiet. I had to look at the tachometer to really know when it was fired up. Backing up the Cruze’s new four-cylinder engine is a standard 6-speed manual transmission or an optional (standard in the LTZ) 6-speed automatic with sequential shifting capability. 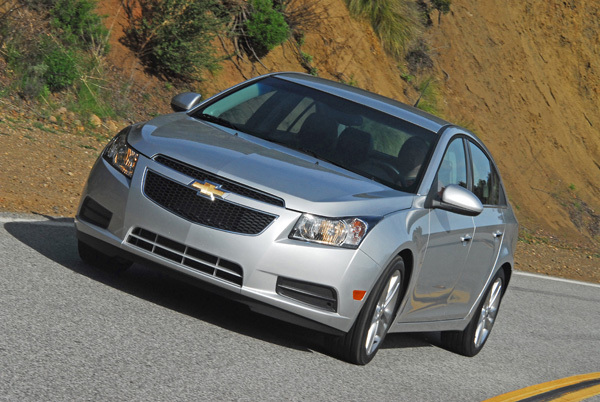 Each part contributes to Cruze’s amazing EPA mileage specs of 24mpg/city and 36mpg/highway. 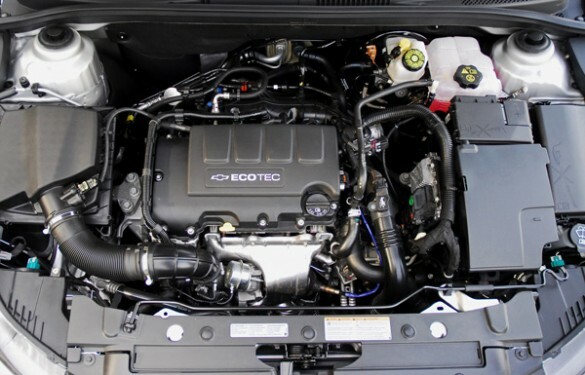 The powertrain elements are backed by GM’s five-year, 100,000-mile warranty, the best coverage in the segment. Complementing Cruze’s new powertrains are a strong body structure and chassis system designed to deliver a responsive and fun driving experience. The body structure is tight and stiff but never harsh, and its solidity enabled engineers to more precisely tune the chassis for comfort and driving control. 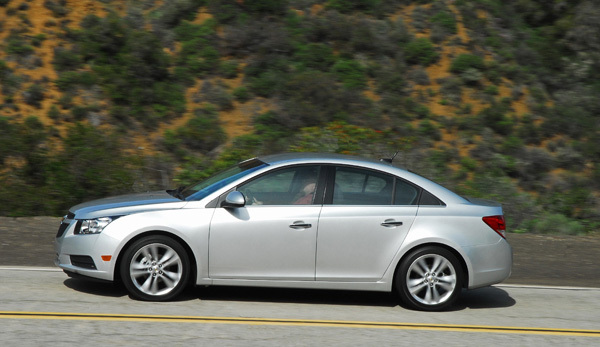 The Cruze does handle more like a front-wheel-drive sport sedan more than any other compact that I have tested so far this year. A MacPherson strut suspension is used up front, while a technically advanced Z-link design is used with the rear suspension. This innovative rear suspension layout reduces unwanted noise and vibrations, allows a comfortable ride and improves the Cruze’s handling prowess. Compared to a multi-link axle, it retains all the advantages of the compound crank, yet it is lighter and more compact. It also provides great wheel camber stiffness, compensates for body roll and keeps constant track width. In addition, it greatly enhances lateral stability. One more advantage of the Z-link is that it reduces axle bush loads and therefore allows the use of softer bushings. This is why comfort, road noise and isolation are all greatly improved. I was particularly impressed by how fast and precise turn-in was while cornering. StabiTrak electronic stability control with rollover mitigation, traction control and power-assisted four-wheel steel disc brakes are standard in the LTZ to help keep you in control of your chosen path of travel on slick pavement and during severe maneuvers. Rack-mounted electric power steering is also standard on all models and it helps save fuel because it removes the conventional power steering pump from the engine’s driven accessories. It was nicely weighed, gave good feedback from the road and had a good on-center feel. 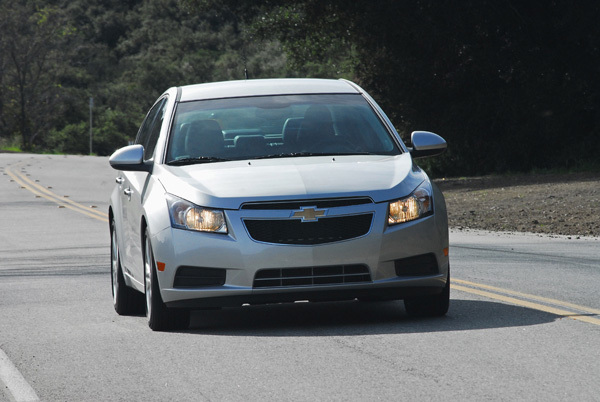 The Cruze LTZ rides on large 18X7in. cast aluminum wheels wrapped with P225/45R18in. all-season radial tires for excellent traction and a very compliant ride over poorly paved roads. Along with a responsive driving experience, the Cruze delivers quietness and refinement on the road. Hydraulic ride bushings and an isolated engine cradle reduce or eliminate vibration pathways that could otherwise be transmitted to the passenger compartment. Similarly, a number of noise-reducing and noise-cancelling technologies are employed throughout the body structure, including 30 distinctive acoustical treatments. 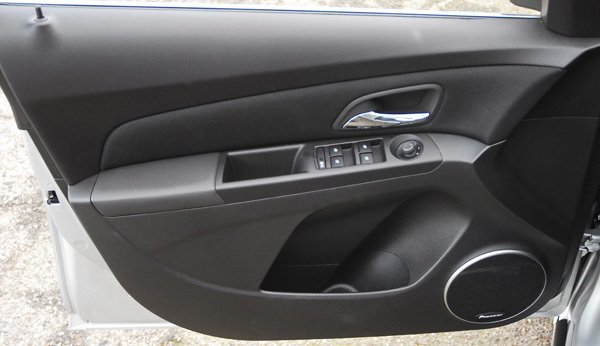 Examples include the steel front-of-dash panel is sandwiched between two damping mats; nylon baffles are used in various hollow portions of the body structure and filled with sound-absorbing foam that expands when the body enters the paint oven; the headliner comprises five layers of thermal fiber acoustic material, including a premium woven fabric on the visible outer layer; patches of sound-damping material are applied strategically throughout the body structure and melt into place when the body passes through the paint oven allowing the patches to follow the contours of the sheet metal below; body insulation material between rear-body structural components that is made from recycled denim; the doors have triple seals and feature fiberglass ‘blankets’ that serve as water, airflow and noise barriers; the doors are also beta-braced, meaning they close with a solid, precise sound and no resonance. You can really hear that solid sound when closing each door, just like a much more expensive German luxury sedan. The all-new 2011 Chevy Cruze LTZ comes with long list of standard equipment-remote vehicle start, oil life monitor system, sport-tuned suspension, power adjustable/heated outside mirrors, variable & intermittent windshield wipers/washers, AM-FM-CD player with 6-speakers, floor mats, USB audio interface, 6-way power driver seat adjustment, AC/automatic climate control, driver/front passenger visors with lighted vanity mirrors, self-dimming reaview mirror, auxiliary audio input jack, leather seats, driver info center, personalization, warning message and vehicle info, 60/40 folding rear seat, pull-down rear center armrest with dual cupholders, front center console with dual cupholders/storage bin with padded armrest, leather wrapped/tilt/telescoping steering wheel with cruise-control, rear window defogger, Bluetooth and audio buttons, cargo cover compartment, power door locks, power windows all with express down, driver-side express up, driver/front passenger heated seats, XM satellite radio free for 3-months, leather trimmed shift lever, grab handles at all four door tops, and dual map lamps. The Cruze is also one of the safest vehicles to be driving or as a passenger as it comes with more safety features than any vehicle in its class, each contributing to Chevrolet’s goal of protecting passengers before, during and after a crash. The long list of safety features includes-dual-stage frontal airbags, roof rail-mounted head curtain side airbags that help protect the front and outboard rear seating positions, seat-mounted side-impact airbags (front and rear), front knee airbags, front passenger seat occupant sensing system, rollover sensing and protection system, collapsible pedal assembly, StabiTrak electronic stability control with rollover sensing, traction control and ABS brakes, three-point safety belts in all five seating positions, safety belt retractor pretensioners and lap pretensioners in the driver and front-passenger positions, safety belt load limiters with pretensioners in the front safety belt retractors, and child seat latching system in the rear seat. Along with the standard safety features in all models-including a tire pressure monitoring system, daytime running lights and automatic headlamps-LTZ models include 4-wheel disc brakes and rear-parking assist. The Cruze has a strong, unitized body structure that incorporates high-strength steel in key areas to enhance strength and crash protection. 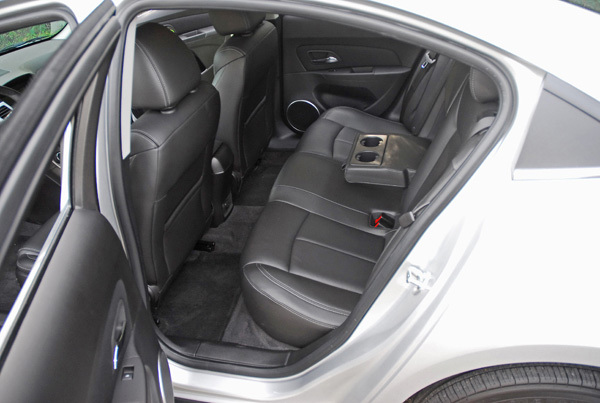 It is used to help prevent intrusion into the passenger compartment. The Cruze also features underbody main rails that extend from the front of the structure all the way to the rear, further enhancing the body’s strength and stiffness. A cross-structure beam behind the instrument panel anchors some vehicle features, while supporting the body during side-impact crashes. Finally, the Cruze is equipped with standard OnStar 9.0 that includes automatic crash response and its latest enhancement, Injury Severity Prediction. This feature helps OnStar advisors alert first responders when a vehicle crash is likely to have causes serious injury to the occupants. With automatic crash response, OnStar uses data from a collection of built-in vehicle sensors that can signal an advisor for help if the vehicle is involved in a moderate to severe frontal, rear or side-impact crash, regardless of whether an airbag deploys. This all-new 2011 Chevy Cruze LTZ sounds more like a upscale luxury sedan with all of the standard interior and safety features, but you’d be surprised that the base price for all of this state-of-the-art engineering, innovation, fun-to-drive, comfort and convenience starts at only $21,975.00. My LTZ was upgraded with the Pioneer Audi System that added just $445.00 to the base price. Wow! What a deal. This should help consumers get use to the new Chevrolet.